For your pleasure or possible immediate dismissal: A small bit of name- and Mario-related trivia that I figured warranted a mention, seeing as how this blog seems to exist right at the nexus of “video game dork” and “word nerd.” Only my last ounce of strength has prevents this blog from transforming into a form for fanboy foaming on about Super Smash Bros. Brawl, an upcoming Wii title that I explain to the uninitiated by likening it to Battle of the Network Stars with Nintendo characters and with the nostalgia factor ratcheted up to a power of at least four. Anyway, last night, the game’s development blog revealed that the central character from the Pikmin series will be included in the melee madness. 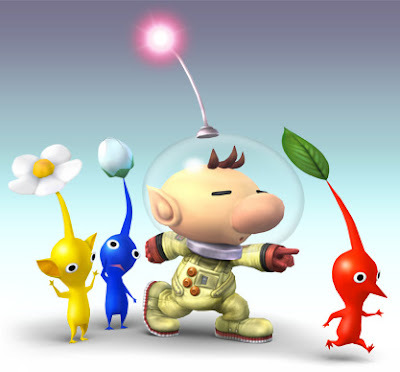 (Not to be confused with that cash cow Pokémon, which Nintendo also owns, the description-defying and underappreciated Pikmin has a pint-sized astronaut leading around small, root vegetable-like creatures called Pikmin. They do his bidding. They die for him. Eventually, they help him repair his spaceship to the point at which he leaves, leaving the Pikmin without anyone to guide them around the various carnivores that also populate this terrible, terrible planet.) The below illustration should help. Small things like this I find interesting.